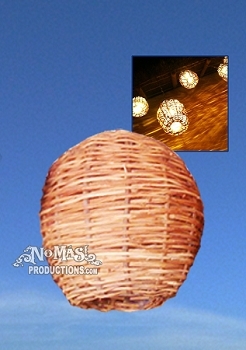 This handwoven fishing basket light is great for decorating. Hang individually or in clusters using our specially designed ceiling canopy (sold separately). 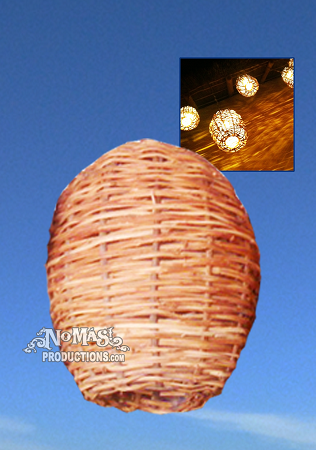 Use a clear bulb and light casts beautiful patterns on walls and ceiling. LED and CFL bulbs can also be used for colorful glow. Can be hung from rope or chain (not included). Ships with black UL approved E27 socket/pendant cord set with 2x075mm pvc round cable 150cm long, easy to assemble; hard-wiring ready. Light bulb not included. Products are handcrafted and variance of size, material, appearance are to be expected. Size: Approximately 9"x9"x13". Shipping will be added at time of ordering, based on volume, weight, and zip code. Inquire for large quantity and shipping discount.